The Human Rights Committee is launching a nationwide youth education program to introduce young people to the utility industry and the union. The goal is to go into schools — grades K-6, middle school, as well as high school — to educate young people on the importance of the work we do and the industries we run. We are calling on local presidents across the nation to join us in this campaign to get UWUA members into our schools. Union presidents can choose members to give show-and-tell presentations, utilize career days and speak to student assemblies, to educate young people about our work and the importance of the union. In this way, we will help rebuild our workforce and our union by showing our youth that a career in the utility industry is available to them. This is part of a concerted effort to fulfill our mission to Reclaim, Retrain, Repower, and Repair America! 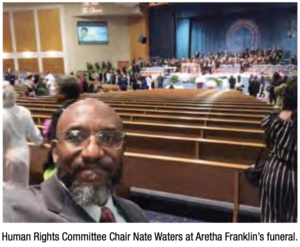 On a personal note, I had the opportunity to attend the funeral services of Aretha Franklin. I was also fortunate to be able to speak to sister Aretha on three different occasions as a service technician working in her home in Bloomfield, MI. We had extensive conversations about her life and her legacy. It was interesting to find out that she wasn’t really concerned about her legacy. She really just wanted to help people through her music. The dignitaries at her funeral all expressed how strong a civil rights activist she was and how beneficial she was to Dr. King’s cause. She traveled with him on a number of occasions and provided bail for numerous civil rights leaders. She was very vocal in her civil rights, human rights, and women’s rights positions. I was honored to be present at her funeral as a representative of the UWUA and the Human Rights Committee. Her legacy encourages me to continue our work. After listening to all the eulogies, it occurred to me that you don’t have to be famous to participate in the fight. All you have to do is to stand your ground, speak truth to power, and exercise your vote.